Many of our birds and other animals rely on tree hollows to live and breed in, but trees with hollows are a dwindling resource. Hollows only form in very old trees, at least 100 years old, so with widespread clearing for farming, timber production or development, many old, hollow-bearing trees are simply not there any more. 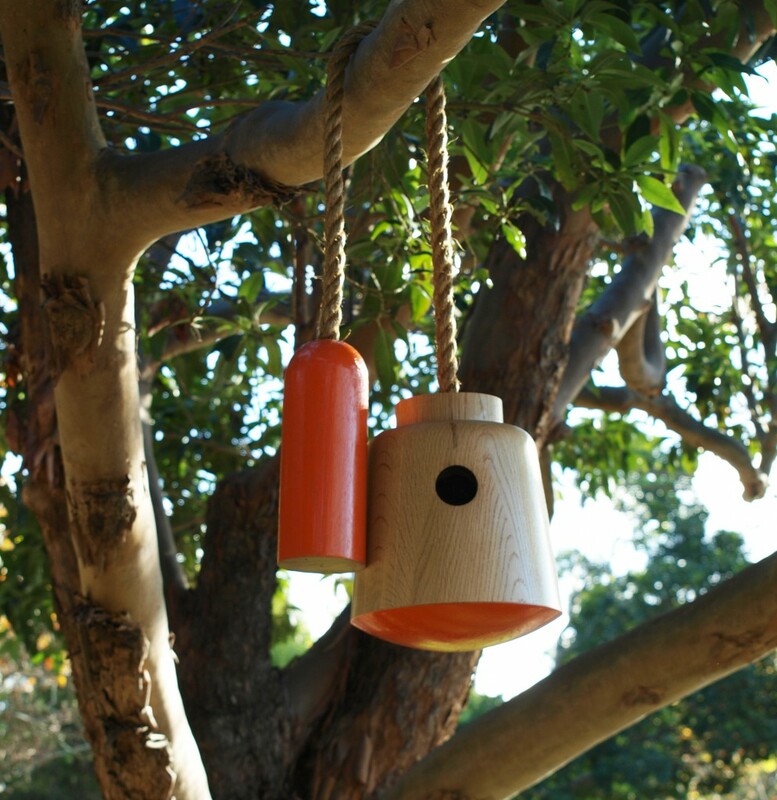 Unfortunately, most of the available man made birdhouses in Australia don’t meet the ideal needs of the birds. Their structures and designs are taken from a European model and few are modified to suit the Australian wildlife. Inspired by the above text, a concept birdhouse & counter-weight was developed, with the purpose to be thrown/flung over and hung from power lines (tree limbs are also suitable). To substitute the common sight of shoes hung from above, replacing it with something that will act in a much more productive and environmentally positive way, providing nesting sites for a selection of native animals in urban areas. Amendment: However as a reflection after manufacture, the combination of material and size have made the product too heavy to throw and therefore it would need to be revisited in a different material and or size to function in this particular way. It is still habitable and suitable for trees, where a ladder is required for installation. In nature the factors of the hollow such as entry size, shape, wall thickness, how protected and how high it is, up off the ground determines who moves into it. Tree hollows, and therefore nest boxes, are used by a wide variety of birds, from tiny Striated Pardalotes and Tree Martins up to Powerful Owls, and including most parrots, and by many mammals as well, such as phascogales, gliders, bats and possums. As they come in all different shapes and sizes and have different specific requirements, no nest box will suit them all. 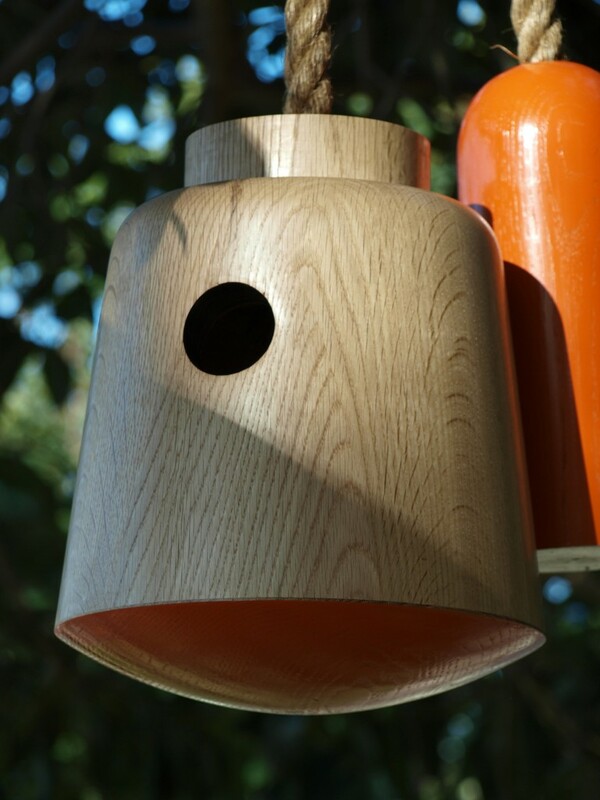 Turned from a large laminated blank of timber, the birdhouse features thick insulative walls, 2503mm internal space and a 60mm diameter entrance. Making this particular birdhouse suitable for Bats (Chocolate Wattled, Gould’s Wattled, Lesser Long – Eared), Small Possums (Sugar Glider, Ringtail), Australian Owlet Nightjar, Striated Pardolote, Rosella and the White Throated Tree Creaper. Amendment: A QR Code has been placed on the bottom of the counter weight and directs intrigued individuals to a webpage of relevant information (like this one). The QR Code could be implemented by councils to relay information about the native birds that nest in the area OR a way to advice the placement and suitability of the birdhouse to certain areas. Either way it’s hoped that it will catch the eye and intrigue onlookers enough to scan.